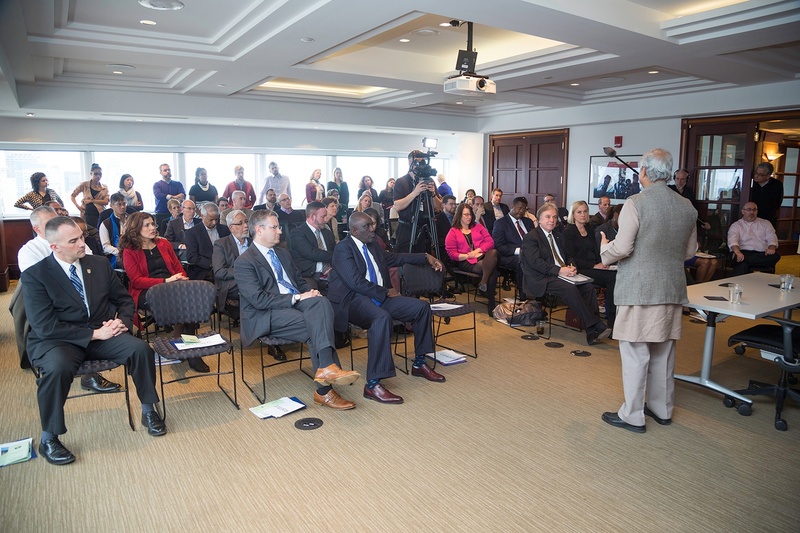 On April 6, Dr. Muhammad Yunus, who was awarded the 2006 Nobel Peace Prize for his pioneering work in microfinance, participated in a discussion about global equity, social entrepreneurship, and other issues at a special event in Boston hosted by New Profit, Deloitte, and the Yunus Social Business Centre at Becker College. The context for the dialogue was how social problem solving has evolved in the 10 years since Dr. Yunus won the prize. On the one hand, hundreds of millions of people have moved out of extreme poverty, thanks to Dr. Yunus’ work and economic growth in the developing world, among other things. Yet, as Dr. Yunus pointed out, global inequality has widened dramatically. The core question we confronted: How can we energize a new movement for problem solving? With characteristic optimism, Dr. Yunus pointed out that, in some ways, we already have by bringing down the barriers that exist between sectors - nonprofit, business, government, and others - to allow for more dynamic and self-sustaining approaches. This is a core theme behind New Profit’s groundbreaking collaboration with Deloitte, the world’s leading professional services firm. It is also the driving force behind the Yunus Social Business Centres that have been launched around the globe. The event kicked off with remarks from Michael Canning, Global Managing Director at Deloitte, who has been a longtime partner and supporter of New Profit, as well as a driving force behind the growth of our collaboration with the company. Among other things, he discussed how Deloitte has evolved its own approach to pursuing social impact, including by launching a new Social Impact Unit, which seeks to use a unique pro bono and for profit model to catalyze transformative problem solving. Dr. Robert Johnson, President of Becker College, built on that theme by discussing his institution's role in building a movement of young and hungry social entrepreneurs through education. At the center of those efforts is The Yunus Social Business Centre at Becker College, a first-of-its-kind institution in the United States that is continuing the work Yunus started in Bangladesh years ago. 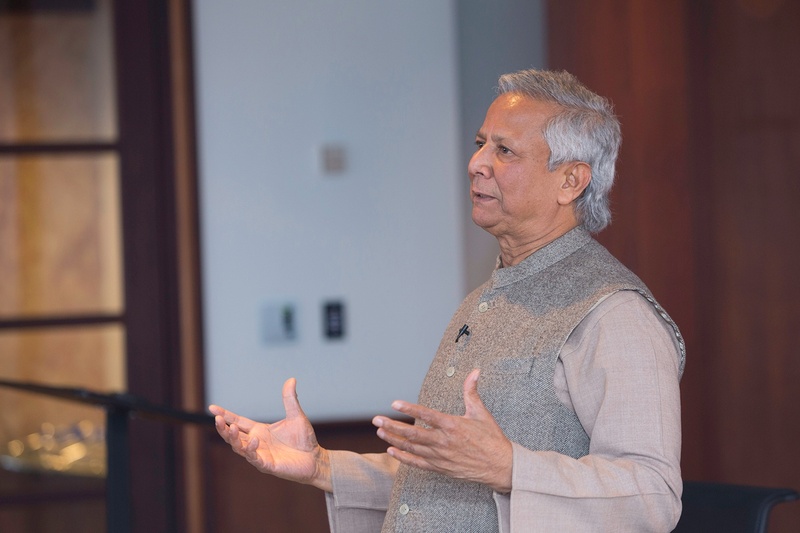 In addition to telling the Grameen Bank story, Dr. Yunus focused on efforts to bring the model to the U.S. After many years working to scaling across the globe, in 2008 Grameen Bank first moved to the United States in Jackson Heights, New York City. Not only is Grameen now in all five New York City Boroughs, it has branches in Los Angeles, San Francisco, San Jose, Omaha, Indianapolis, Charlotte, Austin, Union City NJ, and Boston. Even in the US, Grameen Bank never came below a 99.4 percent repayment rate. In Charlotte, a woman named Perla was struggling to support her family and had heard of Grameen America through a friend. With her first loan of $1,000, set up a stand at a local gas station to sell used clothing. In two years, Perla had graduated to a $3,600 loan that allowed her to move from the gas station into her own storefront, where she now sells dresses, shoes and accessories. With regular hours and a steady income, she is proud of what she has accomplished for her and her family. For every social problem Yunus has faced, he has created a self-sustaining business solution that gives the poor the resources they need to help themselves. The entrepreneur has brought solar energy to villages that save women from respiratory diseases from kerosene fumes, created a joint venture to bring clean, cheap water to villages, and approached the top yogurt company in Bangladesh to create cheap fortified yogurt to combat malnutrition. "I'm happy to be crazy. And I'm looking for crazy people to join me." Yunus responded that our current definition of capitalism, the single minded pursuit of money, “will not work.” He then explained that humans can be selfish and selfless, but capitalism as it is only allows for selfishness. When we build a system that allows for selflessness — social enterprise — we can avoid the kind of inequality that will collapse our society. So what keeps Muhammad Yunus optimistic? Young people. Students and youth who are dissatisfied with the way things are, and who demand social enterprise to move towards the way things ought to be. The Yunus Centre at Becker College strives to create this movement, to evolve social impact, and to create self-sustaining businesses to solve our country’s biggest social challenges. This conversation was presented in collaboration with Deloitte Consulting, LLP, New Profit and the Yunus Centre for Social Business at Becker College. For more insight from Dr. Yunus, keep an eye out for our Jump At The Sun podcast, where Tulaine Montgomery digs deeper into his work and his outlook on the future of social entrepreneurship.